"The Drumat is durable and dependable. Now I can focus on playing and not on chasing my bass drum"
Emanuel White is a comparative newcomer who has exceptional drumming abilities and is a tasteful timekeeper. Emanuel has been playing drums since the age of 5. His greatest strength is to inspire fellow musicians and "lay a serious pocket." Emanuel is quick-witted, personable and professional. His style includes a mix of popular music, jazz, rhythm & blues, reggae, gospel and Afro-Latin rhythms. Currently, Emanuel is working with the internationally renowned, Grammy nominated group, the Stylistics. He has also performed with artists such as Norman Conners, Angela Bofill, Donald Byrd, the Intruders, Edwin Hawkins, the Delfonics and Perfect Blend. Furthermore, "E-Man" has done pre-production work under the direction of producer, Donald Robinson. 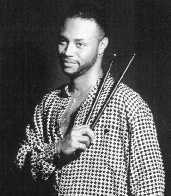 Robinson has produced such artists as Eugene Wilde, Gladys Knight, Vanessa Williams, Rachelle Ferrell, Regina Belle and Grover Washington, Jr. to name a few. Here are some other artists that "E-Man" has been blessed to perform with: Freddie Jackson, the late Phyllis Hayman, Melissa Morgan, Big Daddy Kane (rap artist), Maysa, Blue Magic and Ray, Goodman and Brown. Through his drumming, he has been able to tour the world. "E-Man" is also a full artist endorser of Pearl Drum Company. "E-Man" has also appeared in the well-known magazine, MODERN DRUMMER and is recognized among some of this peers in new books called the COMMANDMENTS OF R&B DRUMMERS, from 1950's to current. This book written by author and mentor Zoro, and released by Warner Brothers contains such artists as Stever Gadd, Bernard Purdie, Darryl Burgess, Ricky Lawson, James Robinson, Earl Young and many up and coming drummers. His goal is to continue to perform with other great artists and to become a positive e mentor for others. Furthermore, he has an interest in doing movie scores. Emanuel is a student at Drum Society, which comprises African and Latin rhythms. Two of his teachers are master drummers, Dr. Gibbs and Darryl Burgess. The Drum Society is an experienced instructors and quality education.